A rather stout, silvery minnow with moderately large eyes and a small, oblique mouth. Scales on forward part of side prominently dark-edged, forming a distinct diamond-shaped pattern. Barbels absent. Midline of back with a prominent dark stripe, broader than dorsal fin base. No prominent dusky stripe along midside. Dorsal fin pointed at tip. Intestine long, with many loops; lining of body cavity uniformly black. Back yellowish-olive, with emerald reflections and a broad dusky or greenish-golden stripe along its midline. Sides silvery, but without a dusky stripe. Belly silvery-white. Fins plain. Breeding males lack special colors but have small tubercles on head, forward part of body and on all fins except tail fin. Distinguished from the Mississippi silvery minnow by its deeper, more slab-sided body; more oblique mouth (front of upper lip above middle of eye); larger eye; distinct cross-hatched pattern from dark-edged scales on forward part of side. Adult length: 3–5 inches; maximum about 6 inches. A lowland minnow that occurs in backwaters of large, sluggish rivers and their associated oxbow lakes. It avoids areas with noticeable current and typically is found over substrates of sand, silt and organic debris. Studies examining the stomach contents of cypress minnows in Kentucky revealed they had eaten sand, detritus, algae and other vegetable matter, which suggests this species is herbivorous. Another clue indicating a vegetable diet is the lengthy intestine, which has several loops—in fish, as in other animals, a long gut is optimal for digesting plant matter. Southeastern lowlands. Recently known only from the St. Francis River at Cash Memorial Conservation Area (Dunklin County) and at Wolf Bayou CA near the Mississippi River (Pemiscot County). 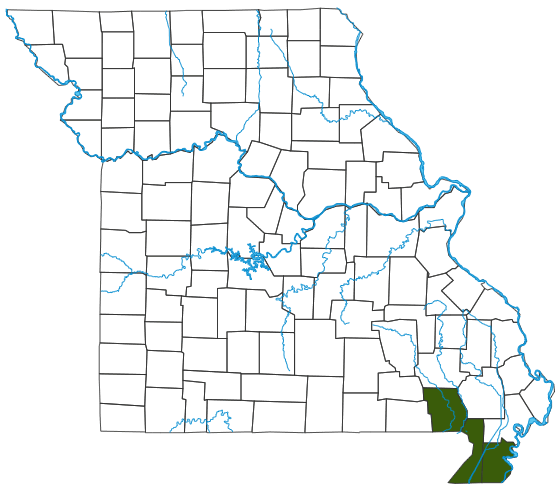 Formerly common in the lower Black and St. Francis rivers (Butler and Dunklin counties). State Endangered; a Species of Conservation Concern in Missouri. Cypress minnows formerly occurred throughout much of the Ohio River drainage and the lower Mississippi River basin from Missouri southward. Today it has drastically declined throughout most of its northern range. Conversion of wetlands to agricultural fields and urban areas has decreased this fish’s habitat. Cypress minnows are mature when a year old and about 2-3 inches long. Spawning apparently occurs in spring, and it is likely that the eggs are scattered over the substrate without further parental care of eggs or young. Although minnows are commonly used as bait for taking a variety of game fishes, this is one species of minnow you should not harvest in Missouri. With its decreasing numbers and limited habitat, the cypress minnow could easily be extirpated from our state.